Turmeric, the old spice or the new medicine? Turmeric (Curcuma Longa) is one of the oldest known spices. It has been grown and used in South Asia, especially in India for at least 5000 years. It reached China by 700 AD, East Africa by 800 AD and West Africa by the year 1200. Turmeric was then introduced to Jamaica in the 18th Century. It is believed that turmeric was used as dye for cosmetic and ceremonial purposes, including weddings. It was associated with fertility and prosperity, and brought good luck if applied to a bride’s face and body, as part of the ritual purification before the wedding. 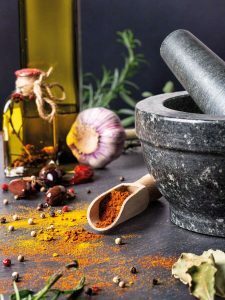 In medieval Europe, turmeric became known as Indian Saffron, since it was widely used as an alternative to the far more expensive saffron spice. Turmeric has become the key ingredient for many Indian, Persian, Thai and Malay dishes, not only in curry, but also in Masak Lemak, Rendang and many more. Today, turmeric is widely cultivated throughout the tropics. Turmeric has a long history of medicinal use in South Asia, cited in Sanskrit medical treatises and widely used in Ayurvedic and Unani medicines. Susruta’s Ayurvedic Compendium, dating to 250 BC, recommends an ointment containing turmeric to relieve the effects of poisoned food. Also, in many old Persian texts especially in Avicenna’s books turmeric is regarded as a “Medicine from Earth”. Turmeric has been traditionally used for disorders of the liver such as jaundice, inflammation, diabetes, diarrhea, slow lactation, asthma and cough. Also, it has been applied externally to fresh wounds, insect stings and to help the healing process in Chickenpox and Smallpox. In recent years, turmeric has gained lots of popularity for its medicinal properties in western medicine. Curcumin is thought to be the primary pharmacological agent in turmeric. In numerous studies, Curcumin’s anti-inflammatory effects have been shown to be comparable to the potent drugs Hydrocortisone and Phenylbutazone as well as over-the-counter anti-inflammatory agents such as Motrin. In a recent research, the use of Curcumin has been suggested in inflammatory conditions such as Crohn’s and Ulcerative colitis and Rheumatoid arthritis. Research conducted at UCLA and published in the Journal of Biological Chemistry (December 2004), which has been confirmed by further research published in the Journal of Agricultural and Food Chemistry (April 2006), provides insight into the mechanisms behind Curcumin’s protective effects against Alzheimer’s disease. In addition, Curcumin has been studied and used for the following conditions: cystic fibrosis, cancer prevention, adjunctive therapy in prostate cancer, improved liver function, cardiovascular protection, and lowering cholesterol. A possible side effect of turmeric is upset stomach, in high doses if taken for a prolong time as it may increase the risk of bleeding. Turmeric may also lower blood sugar, cause hair loss and it should be avoided by people with active gallstones. As always, consult with your physician before taking turmeric or any other supplements.